Green Sheet: "Milwaukee Journal held a design contest for a new city flag — in 1897"
Following the unveiling of the five "People's Flag of Milwaukee" finalists, the Milwaukee Journal Sentinel has this piece on the earliest Milwaukee flag competition, one we talked about back in January. And in fairness, they do give credit where due. Last weekend, organizers of the "People's Flag of Milwaukee" contest unveiled the five finalist designs for a new city flag. The finalists – on display at City Hall, along with the other 45 top entries and 15 honorable mentions – can be rated online at milwaukeeflag.com, with the winner to be announced on Flag Day, June 14. 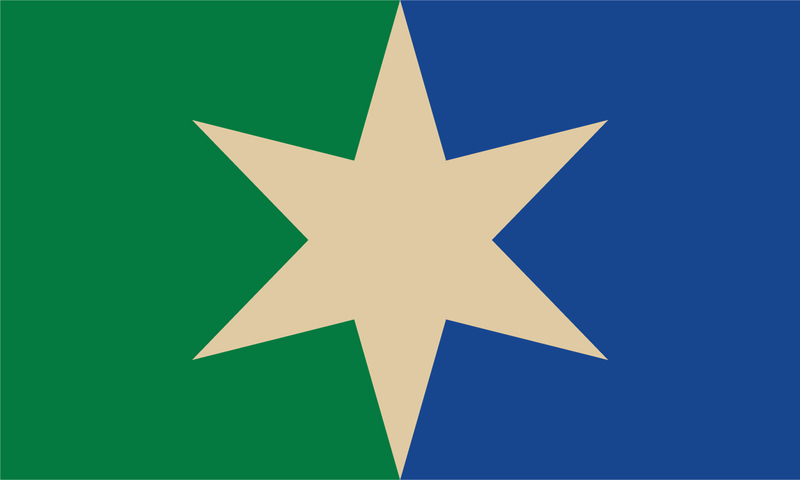 The winner will be pitched to replace the city's official flag, which dates back to 1954, but it's the Common Council's decision. 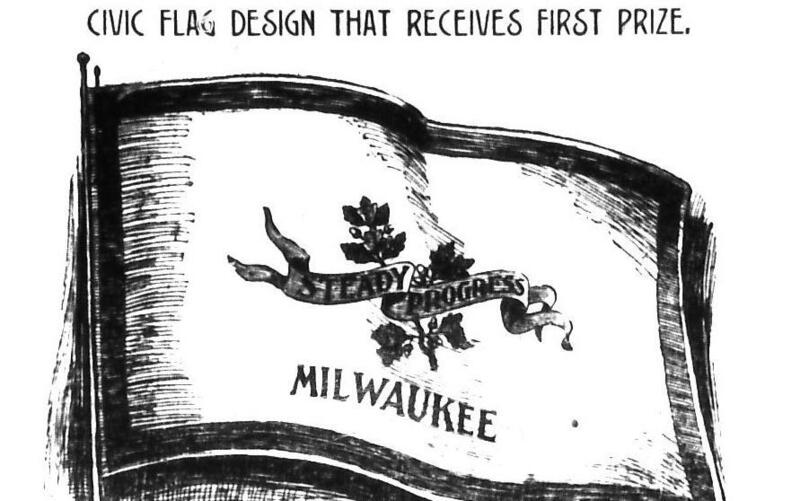 No offense to the organizers of the "People's Flag" contest, but the old Milwaukee Journal already selected a winning design — nearly 119 years ago. On Oct. 30, 1897, the Journal announced it was offering cash prizes for the best designs for a new civic flag for Milwaukee. "The design of such a flag should be emblematic of the city's greatness and of all the features that make it unique among America's most important municipalities," the Journal wrote. "A suggestion of the history of the city, and its resources of art and commerce would also be in order. A civic flag should be dignified and so beautiful in design and harmony of color that it would at once attract the attention and admiration of every beholder." The Journal offered a cash prize of $15 for the best civic flag design, and $10 for the second-best; deadline for entries was Dec. 1, 1897. The judges for the contest were three high-profile Milwaukeeans: Mayor William G. Rauschenberger; John Johnston, a prominent banker; and Lydia Ely, a painter credited by some as the organizer of Wisconsin's first art exhibit and the driving force behind the funding and installation of Milwaukee's Civil War monument, "The Victorious Charge," on what is now Wisconsin Ave. across from Milwaukee Public Library's Central Library. 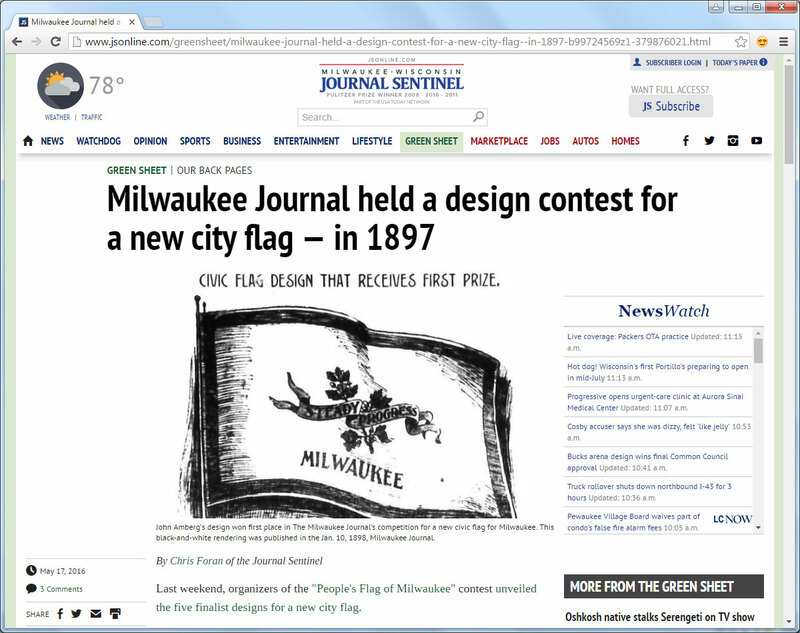 Apparently, the judges initially didn't get what they were looking for: On Dec. 7, 1897, the Journal said the flag design competition would remain open until Jan. 7. "About 50 designs have been submitted, and the judges appointed for the purpose have carefully examined them. 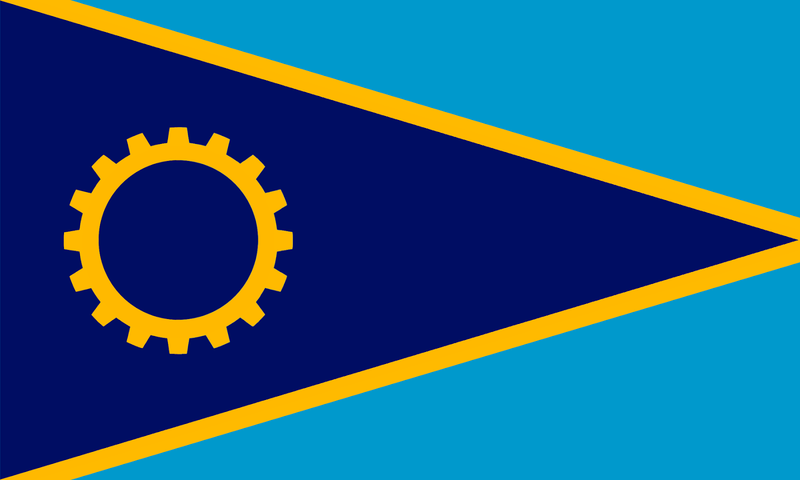 Some of the designs were not accompanied by suitable mottoes, as required, and other competitors made the mistake of thinking that a carnival flag, instead of a city flag, was required," the Journal wrote. 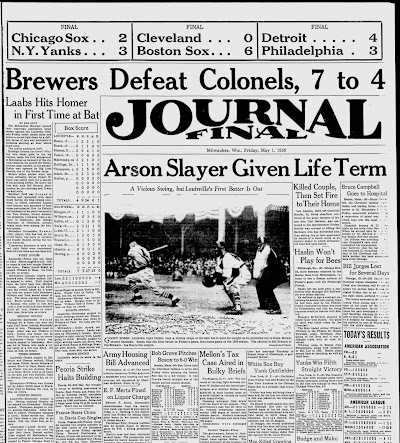 On Jan. 10, 1898, the Journal announced it had a winner. 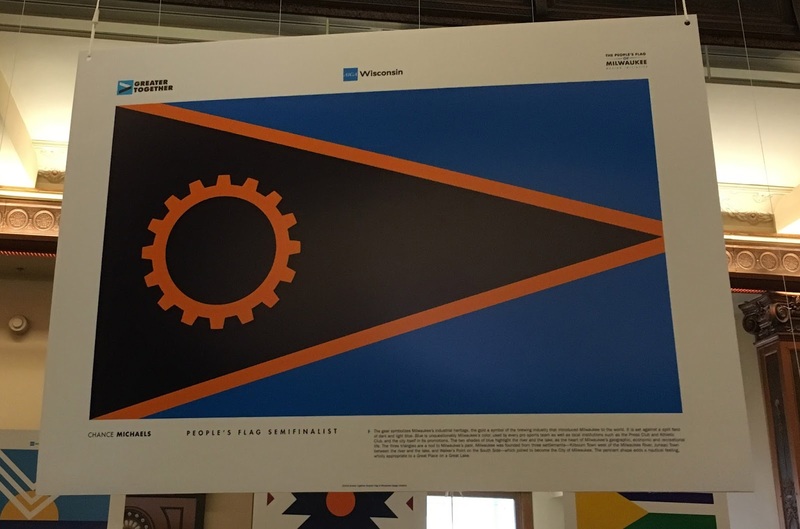 Out of about 150 designs submitted, the judges picked John Amberg's design, which had as its focal point a banner reading "Steady Progress." 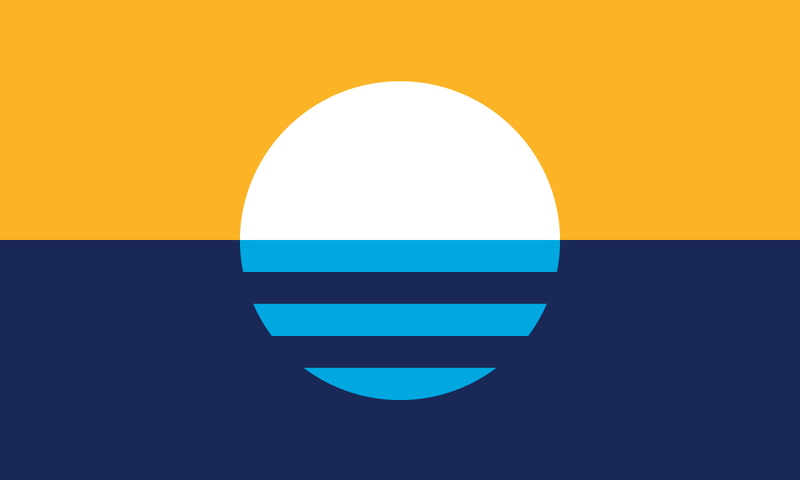 John Amberg’s design won first place in The Milwaukee Journal's competition for a new civic flag for Milwaukee. 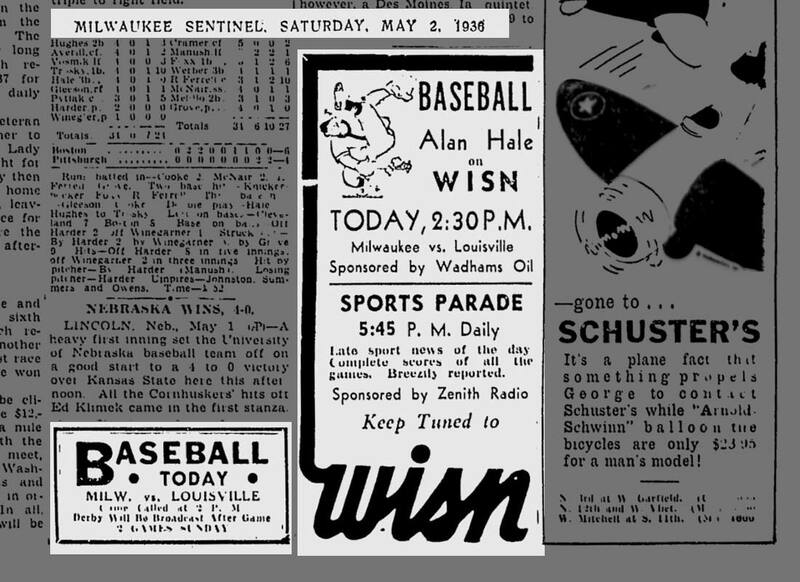 This black-and-white rendering was published in the Jan. 10, 1898, Milwaukee Journal. "The most striking quality of the Cream City as portrayed by Mr. Amberg is its Steady Progress," the Journal wrote. "He represents this trait by a small branch of an oak tree with a few clustering acorns on it, an emblem of slow but steady and sturdy growth from small beginnings. "The word 'Milwaukee' appears below the figure and motto, and the whole is placed upon a cream background, with a border of blue." "The design is simple," Rauschenberger said in the Journal story, "but it is artistic and eminently fitting. The very fact that it is simple will be a factor in having it copied largely and used very generally as a municipal decoration....It is a good plan, and the Journal has shown considerable enterprise as well as rare judgment in proposing and arranging the competition." 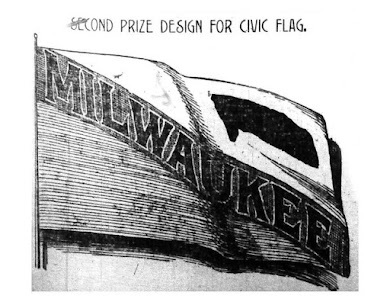 The judges' choice for runner-up — and the $10 second-place prize — went to a design by Fred W. Dickens, with the word "Milwaukee" running diagonally in black letters on a red ribbon. 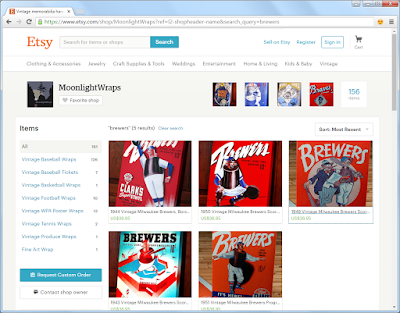 The background was cream-colored on the top half, light blue on the bottom. The runner-up selection in The Journal’s design competition for a civic flag for Milwaukee was by Fred W. Dickens. 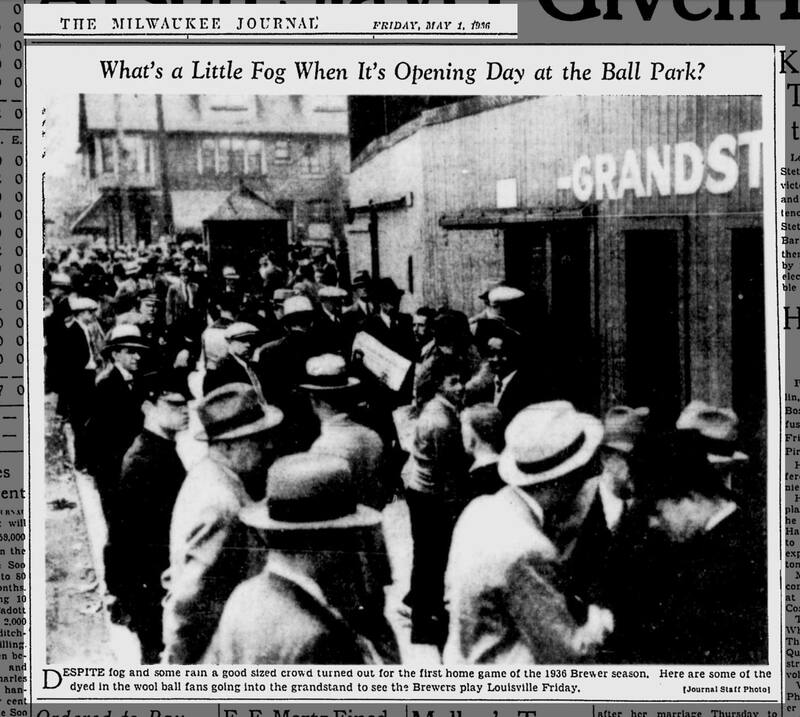 It boasted the word “Milwaukee” running diagonally in black letters on a red ribbon. In a story in the Journal on Jan. 11, 1898, Ely explained why some of the submissions didn't pass muster. One design, which represented the city's three rivers forming a "perfect cross," was thought "altogether too ecclesiastical in appearance." A "very elegant" design incorporating a fleur-de-lis — likely a shout-out to city father Solomon Juneau — was rejected as "too 'Frenchy.'" Still others used hop vines in the design, but Ely said "it was not desired to emphasize this industry above others." In the end, it didn't matter. There is no record of either winning design being adopted for a flag for the city of Milwaukee. In a story on Milwaukee's history with official flags, Chance Michaels of BorchertField.com — a terrific "online museum" of the minor-league Milwaukee Brewers that is also a first-rate tracker of Milwaukee history and popular culture — noted that momentum for the Journal-sponsored flag design might have lost steam three months later when Rauschenberger, a Republican, wasn't nominated for re-election and Democrat David S. Rose won the race for mayor. Michaels, who first reported on the Journal's 1897 design contest in January, also traced the numerous attempts to come up with a city flag — even after the city finally adopted one of its own in 1954. 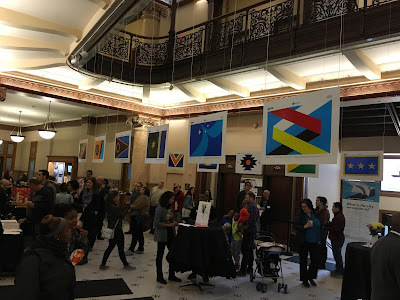 Agreeing with the need for a new city flag, Michaels even submitted five of his own designs in the new "People's Flag of Milwaukee" contest. Unfortunately, none of his designs made the final cut. Thanks for the hat-tip, Mr. Foran. 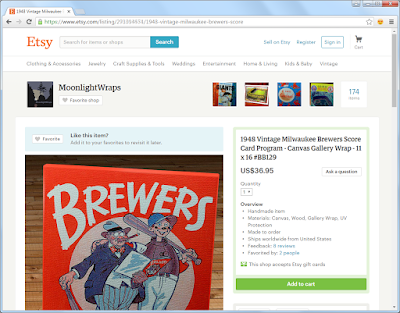 Glad you like the blog, and drop me a line if you ever want to talk about Milwaukee's glorious history, be it baseball, flags, or anything else. 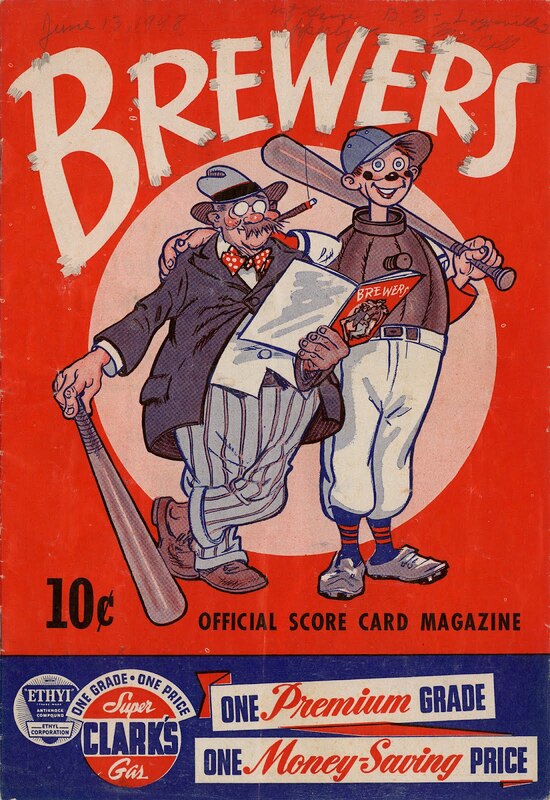 The newest one is based on the Brews' 1948 score card cover. I love it. Great to see our Brewers getting so much play. Make sure you check out all their offerings here. 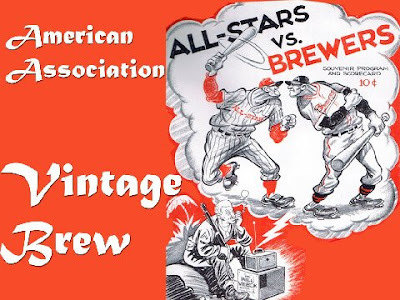 If we continue to buy American Association Brewers merchandise, they'll continue to make more. 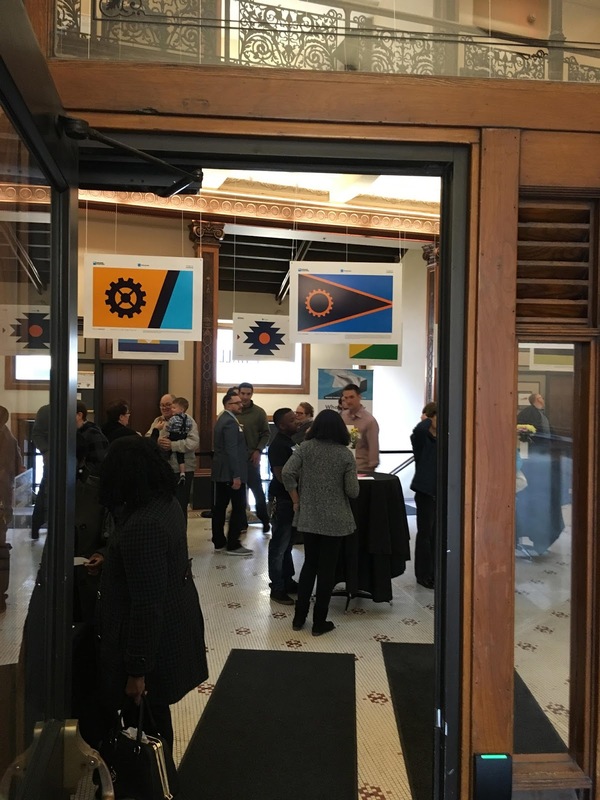 And now, the five finalists in the People's Flag of Milwaukee design competition. I have to admit that these are a little underwhelming. I could easily replace each of these with several from the list of semifinalists. But let's take a look at the five designs individually. Milwaukee’s three rivers flow from the land into the lake, with a large disc representing the city at the confluence and our brewing history. This one's pretty good, although I wonder if the green and blue are similar enough hues to blend together at a distance. I would have perhaps used a bright kelly green and darker navy to separate them. 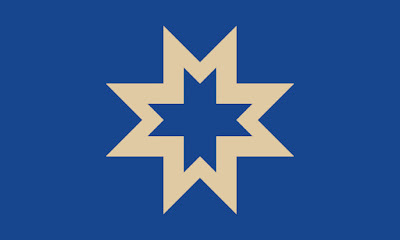 Four “M”s connect to form a cream-colored star representing Milwaukee on the blue lake, its Native American roots, unity, and signifying the city’s bright future. This one is a bit too corporate. Combining four "M"s to create a star is clever, but I'd expect to find this symbol on hotel stationery. 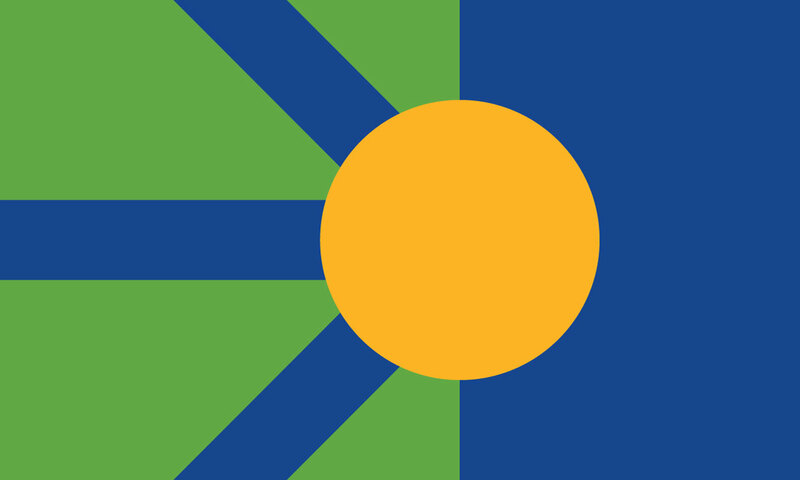 It's a logo, not a flag. Color scheme is great, though. Milwaukee’s past, present, and future, moving in a positive direction, symbolized through its rivers, brewing history, and the lake, with white echoing the art museum. This is by far the best of the five, and the only one really deserving of inclusion. I like the symbolism and the color scheme, and breaking up the colors with white bars really make them more vibrant. The sun rising over Lake Michigan symbolizes a new day. The blue bars in its reflections represent the city’s three rivers and founders. I do like this design, but the colors don't work for me. The overall effect is drab and moody; a more royal blue would improve this one greatly. The six points of the star symbolize the three original sections of the city and its three rivers and representing Milwaukee as the “Cream City” and the largest in Wisconsin. This one's just inexcusable. 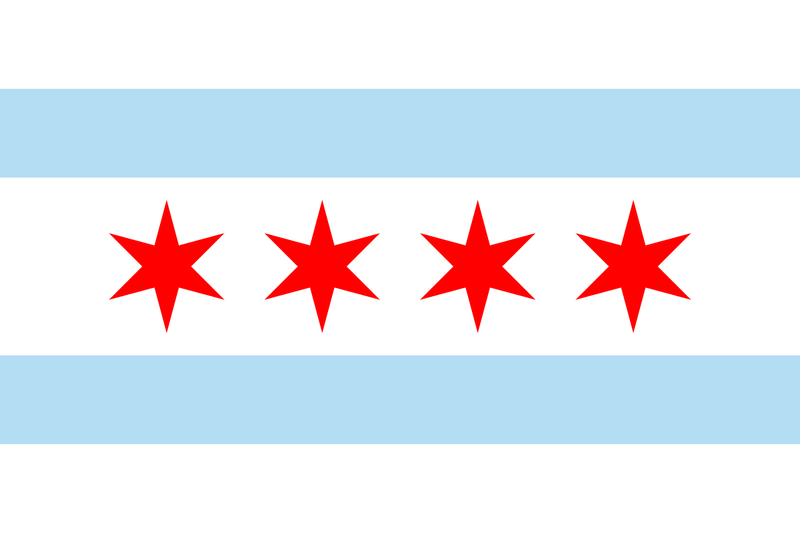 The basic design is sound enough, but the distinctive six-pointed star is a direct lift from Chicago's flag. Milwaukee has enough of a little-brother complex towards its larger neighbor to the south without enshrining that on a copycat flag. And there you have it. 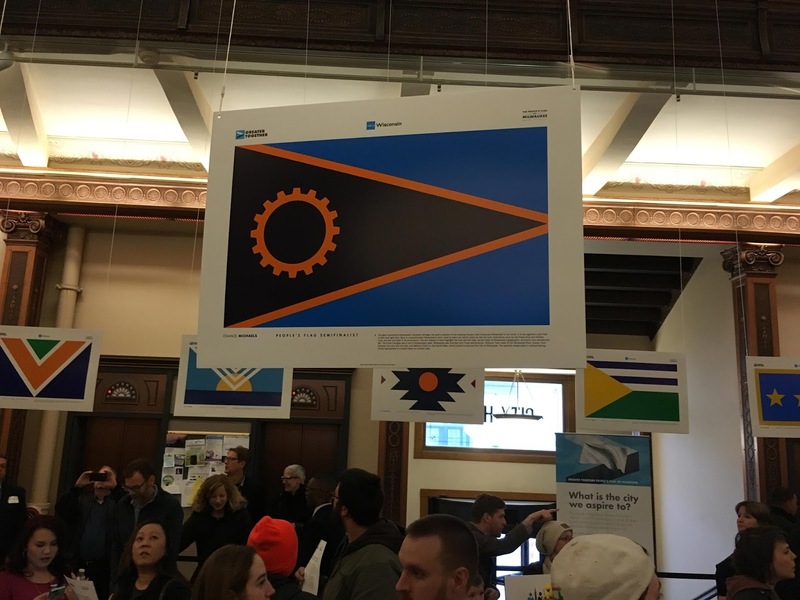 The People's Flag of Milwaukee will be chosen from one of those five. 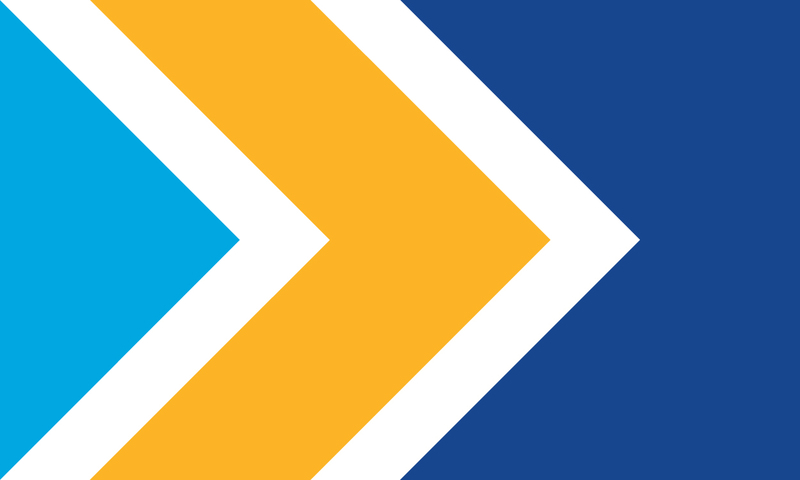 We'll see if anything comes of it, but if anything other than Chanya Hughes's "Golden Arrow" design is the ultimate winner I'm kind of hoping this contest goes the route of the last two attempts to replace Milwaukee's flag. We'll scrap it and start another conversation in twenty years, as has been the city's modus operandi. I'm honored that one of my submissions was chosen as a semifinalist in the "People's Flag of Milwaukee" design competition. The gear symbolizes Milwaukee's industrial heritage, the gold a symbol of the brewing industry that introduced Milwaukee to the world. It is set against a split field of dark and light blue. Blue is unquestionably Milwaukee's color, used by every sports team as well as local institutions such as the Press Club and Athletic Club, and the city itself in its promotions. The two shades of blue highlight the rivers and the lake, as the heart of Milwaukee's geographic, economic and recreational life. The three triangles are a nod to Milwaukee's past; Milwaukee was founded from three settlements&mdahs;Kilbourn Town west of the Milwaukee River, Juneau Town between the river and the lake, and Walker's Point on the South Side— which joined to become the City of Milwaukee. The pennant shape adds a nautical feeling, wholly appropriate to a Great Place on a Great Lake. 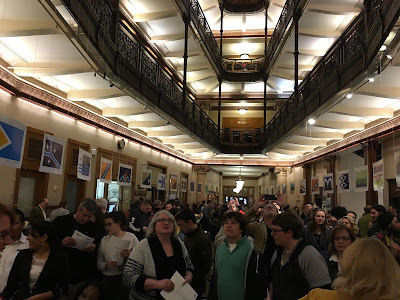 As you can see, the event attracted a big crowd. Milwaukee's mayor, Tom Barrett, spoke before the assembly. 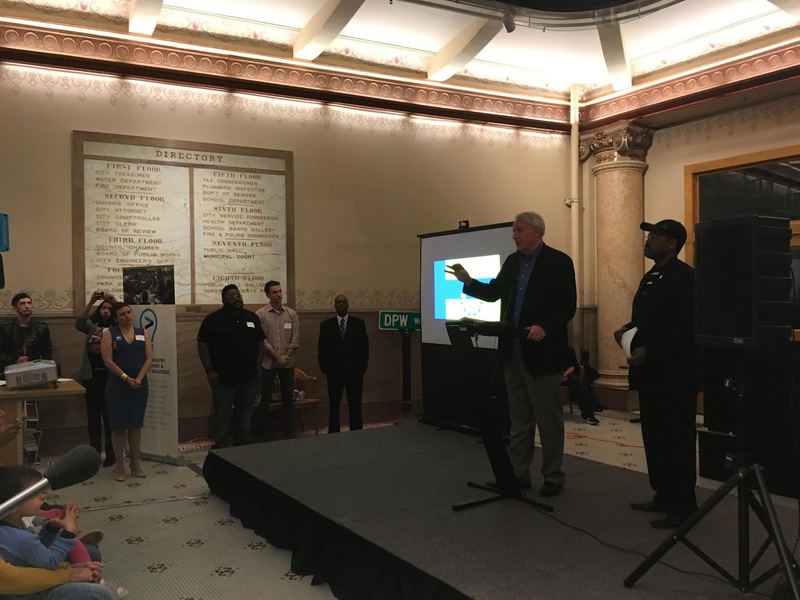 Mayor Barrett is reportedly sympathetic to the campaign, although he has not committed to adopting or promoting the eventual winner. We'll talk about the five finalists soon, but today I just want to bask in my little contribution to the process. "Buy me some Peanuts and Cracker Jack..."
Editor's Note: Paul Tenpenny has a rare treat for you today; a brief home movie shot at Borchert Field! Dates really don’t matter much when it comes to our memories as they last us a lifetime. While not always accurate, we cherish every detail remembered. 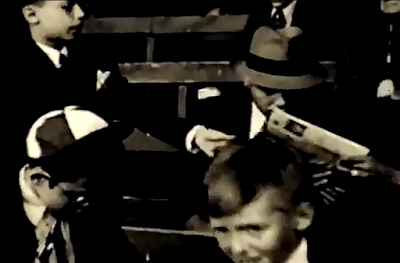 When it comes to baseball, we all have those memories of going to a ballgame for the first time. For me it was my father taking me to see the Milwaukee Braves at County Stadium. The green grass of the outfield, the manicured infield and the colorful uniforms blended perfectly within this dreamscape of my youth. Add to that the crack of the bat, the cheers of the crowd and you have found paradise for a young fan. Not to mention, the hot dogs, sodas, souvenirs etcetera, all of it etched deeply in my memory. Whether it was 10 years or 75 years ago…we do lose some of the details. How lucky would it have been to have someone film the experience so we could really relive that day as it happened? A movie camera is now as close as our phones these days and someone can always take pictures or videos to chronicle the minutiae of our lives. In the pre-war days of 1940. This would have been rare if not impossible. A snapshot or two, maybe, a film, never! 11 year old Jim Keppeler and his bespectacled brother, Francis (what a great cap!) 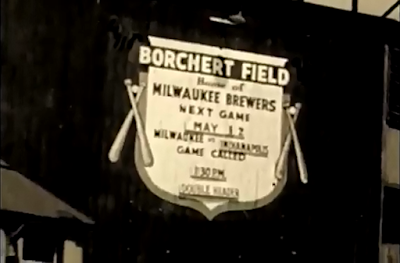 were treated to a visit to Borchert Field by their father, Joseph on Sunday May 12, 1940. 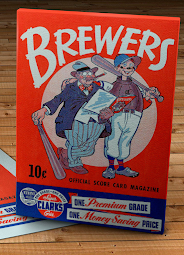 The Brewers were hosting the Indianapolis Indians in a double header on this spring day in Milwaukee. Everyone had on their Sunday best, even the kids wore ties as you can see from these pictures. A far cry from our casual days of today. 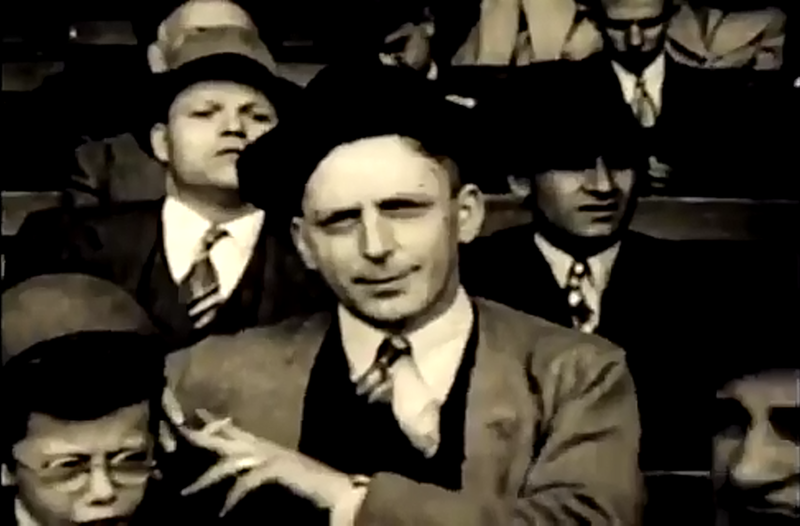 Dad looked relaxed, enjoying a smoke while the boys were having the time of their lives. While the film runs less than a minute (36 seconds to be exact), it shows us a rare glimpse of this Northside neighborhood in the 1940’s, including the peanut vendors on the street. Inside the ballpark, dad poses for the camera, taking off his fedora, smiling and showing off his deftly combed hair. Fans behind them can be clearly seen passing a program. What a day it must have been. It was a rough season for the Brews, finishing in last place with a record of 58-90. A detail I am sure is best forgotten. 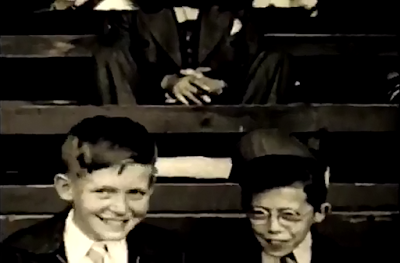 Special thanks to Jimmy (James) Keppeler for sharing his Grandfather’s (James) memories with us here at Borchertfield.com. Priceless memories. "What's a Little Fog When It's Opening Day at the Ball Park?" 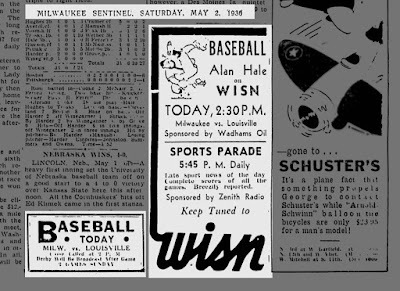 This photo was printed in the Milwaukee Journal on May 2, 1936, as part of their Opening Day coverage. I deserves a spotlight of its own. I don't think I've ever seen a photo of the grandstand entrance before. Behind the patrons, we can see one of the Orchard's distinctive sidewalk ticket kiosks. I love the houses in the background, reminding us that it truly was a neighborhood ballpark. This photo is a rare street-level look at Borchert Field. Really gives us a sense of what it was like to attend a game. That's Mayor Daniel Hoan throwing out the ceremonial first pitch (for the record, it was "low and wide"), and Philip La Follette beaming as he watches the game. To the right, #28 is Chet Laabs, hitting his fifth homer of the season in his first trip at bat. 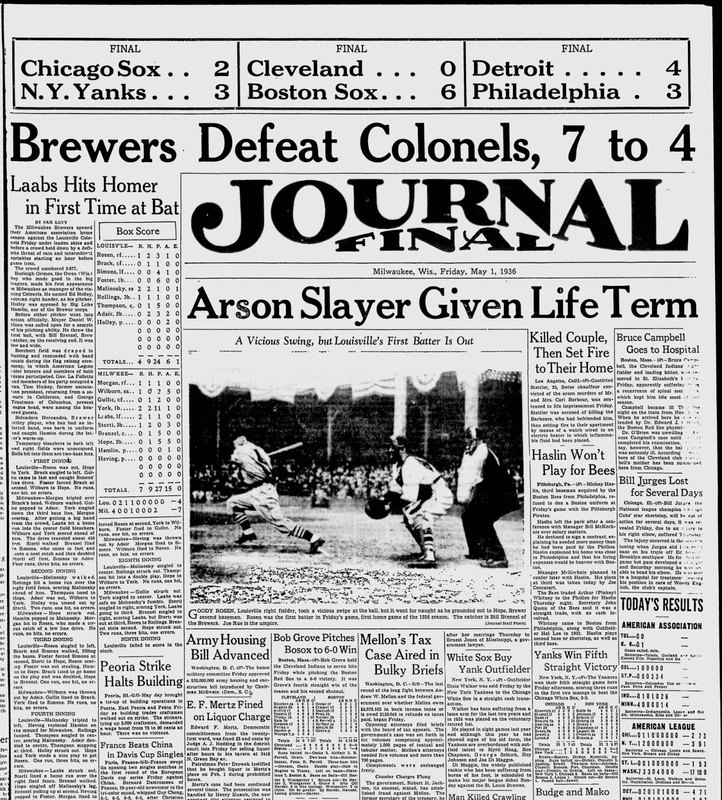 The Journal led with a photo of the first batter grounding out to second. That's Milwaukee catcher Bill Brenzel behind the plate. As the headlines indicate, the Brewers came out on top, defeating the Colonels 7-4. 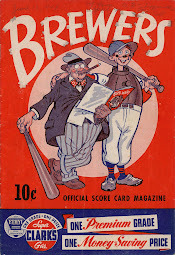 9,677 fans turned up to Borchert Field to see the Brews open the season. Temporary bleachers had been set up in left and right fields, but they were not used. Balls hit into the empty stands were ground rule doubles. 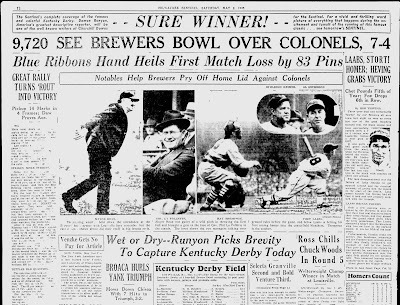 Borchert field was draped in bunting and resounded with band music during the flag raising ceremony, in which American Legion color bearers and members of both teams participated. Gov. 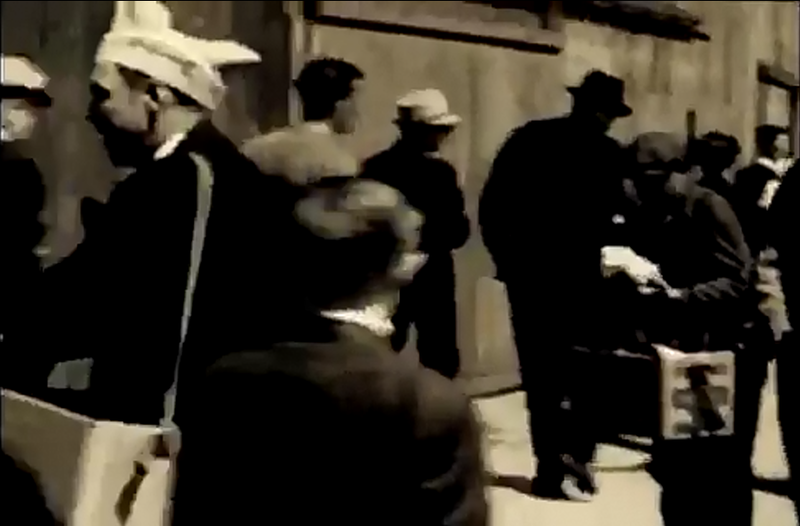 La Follette and members of his party occupied a box. Tom Hickey, former association president, returning from a sojourn in California, and George Trautman of Columbus, present league head, were among the honored guests. WISN had a long history with the Brews. Good to see they were helping Milwaukeeans follow their club.